Two weeks ago I ordered Prusa i3 Rework 3d printer kit from Replikeo and it finally arrived yesterday. I honestly did not expect to receive it so quickly, so it was a nice surprise. I’ve read some posts about box arriving damaged so I quickly checked everything and it seems Replikeo learned from it’s mistakes. Everything was packaged very neatly into styrofoam compartments. It did not look like anything was damaged in any way. As others stated printed plastic parts seem of a low quality, some have gaps between layers, making me worry that it might break soon. As recommended first thing I’ll after I get printer working is to print better quality replacement parts. Everything else seems to be of adequate quality. I was surprised to find what looks like a genuine Arduino Mega R2, not a clone. I couldn’t wait any longer so I decided to start assembly process. That’s where things got really frustrating. Because Prusa i3 is an open source project, it’s difficult to find clear and detailed instructions on putting it together. What makes things really bad is that Replikeo included links to YouTube videos which were not for “Rework” edition of the Prusa i3. Yes there’s a difference and it’s significant for a person who never assembled 3D printer. As I started to follow YouTube video, I got completely stuck because rod lengths and printed plastic parts were different from what I received. 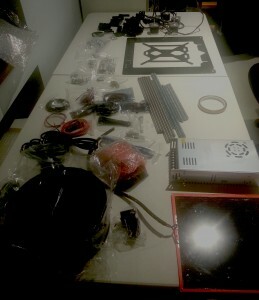 Fortunately there’s an official RepRap instructions on how to assemble this 3D printer. I was able to follow it with some difficulty, but it’s doable. Problem was that assembly sequence in YouTube video vs. official instructions varies so I had to figure out how to put things together. Official manual mentions need to drill holes in plastic parts, but holes seem to be already there, so I’m still not sure if they were pre-drilled or printed this way and if they can be printed why drill at all? Also Replikeo hardware is still different from pictures on the instructions, but I can adopt. Before I finish this post I wanted to add a note on LM8UU linear bearings. It’s not mentioned anywhere but at first these bearings are almost not moving on the smooth rood, they are really stiff! But if you move them by hand back and forth they start to slide easier and easier. It does sound like they are scratching the rods slightly, so I don’t know if it’s normal or they just low quality. So far I only started and it will probably take me few more evenings to complete the assembly, so I will keep you updated.